If you have visited Henllys before you may be aware of the interesting historic site that lies just off the road leading in. 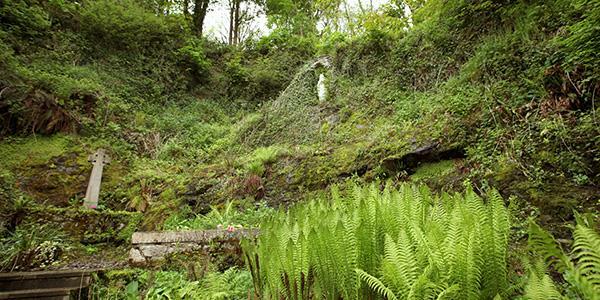 The remains belong to what was once a little Franciscan friary and they are just minutes from the front door, so while you are on site be sure to wander down to take a look. So what’s the story behind the friary? First founded in 1237, it is thought that this little Franciscan friary was established by Llywelyn ab Iorwerth in memory of his wife Joan who died in the same year. The friary was located in what was once the medieval town of Llanfaes, on the Isle of Anglesey. Joan, who was the daughter of King John, was buried at the Friary and as a result the place became associated with female members of the royal family of the county of Gwynedd. In 1282 it also become the burial place for Eleanor de Montfort, Princess of Wales. Over the years it suffered various damage and the town of Llanfaes was actually dissolved. The friary underwent restoration in the 15th century, despite the surrounding town having long disappeared. It’s likely that as well as a church there was once also accommodation, refectory and agricultural holdings. But in 1538 Henry VIII’s Dissolution of the Monasteries saw the end of the friary and many of its buildings were demolished. By the 19th century, just the friary church remained, and it was being used as a barn! If you visit it today you can still see evidence of the floor and a few relics of what was once here. After Llanfaes was depopulated in the 14th century Henllys became the main residence of note in the area. Its lands were expanded so that by the mid 17th century it incorporated much of the former Llanfaes. It’s for this reason that the old friary lies within its grounds, just a matter of seconds from the front door.